But you’ve still got dancers on your gift list! And Amazon is telling you that paying expedited $hipping fee$ a dose of Elf Magic is your only Ho Ho Hope for the timely arrival of those gifts. 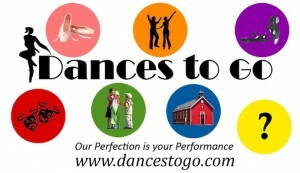 DancesToGo.com provides à la carte choreography for a variety of dance levels and genres. They’ve got a great group of guest choreographers with years of experience as teachers (and I’m not just saying that ’cause I’m one of them)! One way to gift it: You may not know which choreography would be most useful for the gift-recipient. Since Dances To Go uses PayPal’s services, you could send money to your dancer friend or family member (they will need a PayPal account) for use at the site. While you’re at it, send them an iTunes gift so they can grab the music, too! DanceStudioOwner.com gives studio owners what they need to be successful – e-books and articles, monthly teleseminars, templates, checklists, customizable forms, and plenty of support in an often isolating job. This is one of my favorite resources because they offer so much value at affordable monthly and yearly membership plans. Gift a membership and make your favorite studio owner very happy. A new year. A new commitment to going the extra mile in your dance classes. 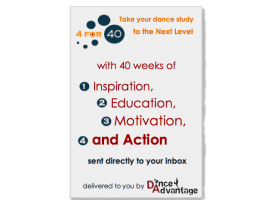 We at Dance Advantage deliver the keys to make this year outstanding with an e-mail course that provides terminology, an inspirational quote, something to Dancescribe in a dance journal, and something to do EVERY WEEK in a 40-Week E-course. Let us sustain and motivate your favorite dancer the whole year through. Yes, you can “gift” this e-course. It’s called 4 for 40 and you can find it right here. Whether your gift-recipient is Team Nook or Team Kindle, you can give specific digital publications as gifts at the Nook Store or Kindle Store (just look for the Buy/Give as a Gift links on the book’s purchase page). There are so many more! Search for dance or ballet or something more narrow in either store. iPad users don’t have to miss out on the fun either. E-mail gift cards are available for each service. …then suggest items from our dancer-friendly reading list! Dancers will dig watching dance too! KineticFlix.com is DVD rental for the dance & fitness industries. Get a Gift Certificate and your dancer can queue up his/her favorites. Got some more last-minute dancer gift ideas? Tell us about ’em in the comments! **In the interest of full disclosure: Dance Advantage has an affiliate relationship with both Amazon and iTunes, meaning we get a very small commission on any purchases made via our links. We have a similar but more significant relationship with our friends at DanceStudioOwner.com. DA does NOT earn referral commissions from Barnes & Noble, TenduTV, KineticFlix.com,or PayPal (though we like them a lot). And other than for Nichelle’s own choreography sales, DA earns no referral commission from DancesToGo.com.